In September 2016, a Nevada woman died of a bacterial infection. The woman, in her 70s, had been hospitalized previously in India due to a fracture of her right leg, which led to bone infections and more subsequent hospitalizations. During these infections, she almost certainly received antibiotics to help her recover, especially given that in India, the guidelines regarding antibiotic use are often not followed or regulated very stringently. This only made the bacteria that managed to survive stronger; remarkably, testing has since revealed that the strain that killed her was resistant to all 26 antibiotics available in the United States. In its recently released report, the Centers for Disease Control and Prevention (CDC) mentions that the mechanism of resistance was not due to the well-studied MCR-1 (mobilized colistin resistance) gene, which resides on a piece of DNA that can be easily passed between bacteria. Additionally, though it was not known at the time, this particular bacterial strain was found to be susceptible to fosfomycin, an antibiotic that is currently not approved for treatment of bacterial infections. Antibiotics are widely used in the U.S. and around the world. They can be found in hand soap, animal feed, paint and even in coatings on children’s toys. Because antibiotics are everywhere, the selective pressure for bacteria to evolve resistance to antibiotics is too. When treatment with one antibiotic doesn’t work, another takes its place. Furthermore, relaxed rules and regulations regarding antibiotic use in other countries, including India, appear to be accelerating the pace of the mounting antibiotic resistance crisis worldwide. Since its discovery in 2009, the resistance gene NDM-1 (New Delhi metallo-beta-lactamase) has spread to over 70 countries, demonstrating the alarming rate at which bacteria can swap these dangerous genes. The problem now is that bacteria are evolving as quickly as scientists can synthesize new or modified antibiotics. Antibiotic resistance puts everyone at risk. 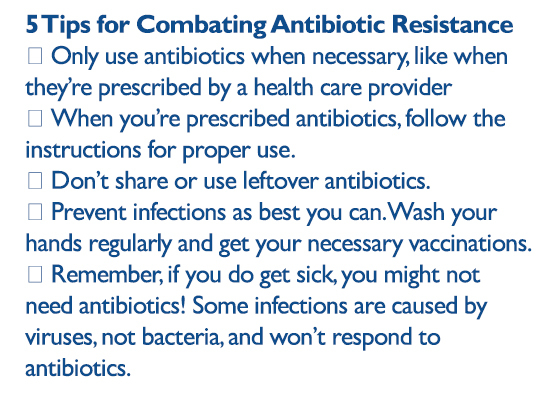 Everyone can help to mitigate that risk by following CDC and World Health Organization guidelines for combating antibiotic resistance. First, only use antibiotics when necessary, such as when prescribed by a health care provider, and be sure to follow the instructions for proper use. Don’t share or use leftover antibiotics. Prevent infections as best you can, especially by washing your hands and getting necessary vaccinations. It’s also important to remember that if you do get sick, you might not need antibiotics! Some infections are caused by viruses, not bacteria, and won’t respond to antibiotics, but without ordering lab cultures, it may be difficult to discern between the two. Don’t be surprised if your doctor asks you to wait an additional week to see if your symptoms subside on their own before writing you a prescription for antibiotics. Health professionals have a crucial role. Limiting prescriptions to when necessary and instructing patients on their proper use may help prevent suboptimal or incorrect use. The battle against antibiotic resistance will continue for as long as there are antibiotics. Staying one step ahead will require constant vigilance. Don’t Reach for That Antibiotic Just Yet. When is a cold just a cold? How do antibiotics work in the body? Resistance Fighter: Since joining the CDC, Arjun Srinivasan has been dedicated to helping hospitals improve their use of antibiotics, in an effort to decrease the health care burden of multidrug-resistant organisms.